These teenage parents are black, white, Hispanic; city dwellers and residents of small towns; rich and poor. 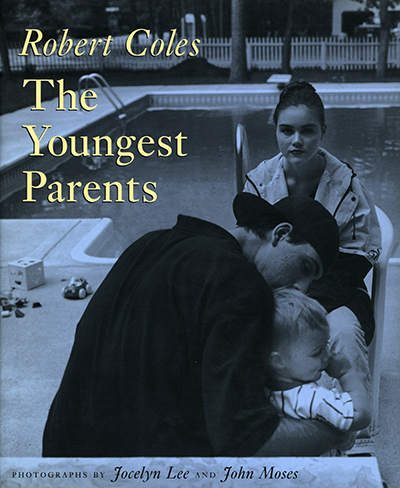 Prominent child psychiatrist and Pulitzer Prize–winning author Robert Coles asks us to shed our preconceptions and listen to the voices of young men and women who are about to become parents, though barely out of childhood themselves. From conversations with them, Dr. Coles weaves together a subtle yet dramatic narrative that reveals the aspirations and apprehensions of these “youngest parents.” Photographers John Moses and Jocelyn Lee share striking and often poignant portraits of young parents—images of capable and caring young mothers, fathers, grandmothers, and grandfathers along with images of new parents who seem nervous and unprepared for their new responsibility. The visual essays complement Coles's thoughtful reflection on the experiences and expectations of young parents whose prospects are beset with difficulty but whose perspectives are often surprising. "A striking and revelatory set of verbal and photographic portraits of teenage parents. . . . Discussions of parenthood evolve into musings on racism, welfare, school, religion, work, love, loyalty, and the meaning of life. Coles doesn’t try to dispel the ambiguities inherent in these conversations, nor do the photographs of Jocelyn Lee and John Moses. Their evocative subjects hold our gaze, commanding respect and empathy even as they arouse deep concern."